Meanwhile, last week saw a rollercoaster of court decisions about voter suppression laws. In passing these laws, the GOP has openly declared that the reason for photo IDs required for voting is to keep Democrats from have their rights at the ballot box. With fewer than 31 fraud cases in over 10 years, the number of legitimate voters kept from voting has vastly increased. Joy Dunn, 79, is an eligible voter who found out that new laws had disqualified her vote after her absentee ballot in March’s Arkansas special election was rejected. Dunn has been voting in the state since 1954—when she had to pay a $2 poll tax—and was never told that she had to mail a copy of valid ID with her absentee ballot. Arkansas’ new law includes only $300,000 for full implementation, including education, in 75 counties. Some North Carolina citizens lost voting rights after the Supreme Court overturned a circuit court decision giving voters same-day registration and counting votes cast in the wrong precinct. This temporary ruling covers the November 4 election although the Court has until next year to make a decision about the restricting voting laws. This decision follows the one that upholds limiting votes in Ohio. In contrast, the Supreme Court gave voting rights to Wisconsin, making three different positions this year. A federal trial court halted the mandatory photo ID for the upcoming election, a panel of the 7th Circuit Court of Appeals overturned the ruling and made photo IDS mandatory, and then the Supreme Court overturned the circuit court. Three weeks before the general election, 9 percent of registered voters in Wisconsin didn’t have the necessary voter ID. Even Justice Samuel Alito, one of three judges who voted to keep the restrictive Wisconsin law, admitted that courts should not issue orders affected a state’s election law when the election is near. The accusation of fraud, ostensibly the reason behind the Wisconsin law, found no cases that could have been prevented by a voter ID law. 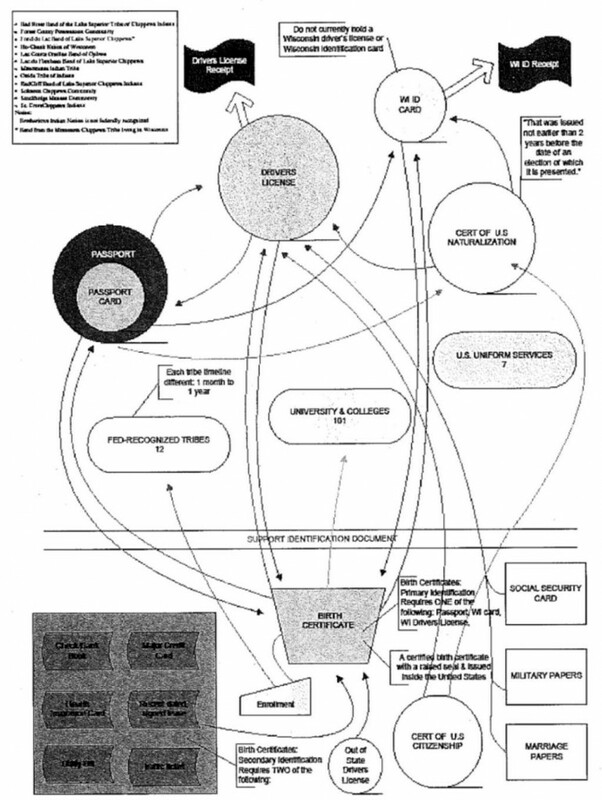 The following chart, an official one from the state to help people “understand” the photo ID law, may have persuaded the other judges how impossibly difficult Wisconsin was trying to make voting. People who cheerfully maintain that voter ID makes no difference in voting are now faced with a report from the Government Accountability Office, Congress’ nonpartisan investigative agency. It found that “states that toughened their voter identification laws saw steeper drops in election turnout than those that did not, with disproportionate falloffs among black and younger voters.” The decline was among eligible and registered voters, not people trying to defraud the government. The greatest affect was on voters 23 and younger, new voters, and blacks. Voters with driver’s licenses or state IDs range from 84 percent of 95 percent, depending on the state; these IDs cost from $14.50 to $58.50. The GAO also found no voter-fraud problem. Despite this information, the Supreme Court is permitting North Carolina’s law to eliminate same-day voter registration and to ban votes cast in the wrong precincts. Justices Sonia Sotomayor and Ruth Bader Ginsburg dissented. When the GOP took over states in 2010, the legislatures and governors gerrymandered the districts to put as many of their party into Congress as possible. The ten worst gerrymandered districts in 2013 are here. Federal judges have declared the congressional maps in Virginia to be unconstitutional because they isolate blacks into a single district. The order won’t go into effect this year and the case can be appealed to SCOTUS, but at this time the judges have demanded a new map by April. Republicans need to get the Democratic governor to agree to their redistricting. If Gov. Terry McAuliffe won’t sign their map, the judges may end up redrawing the districts. 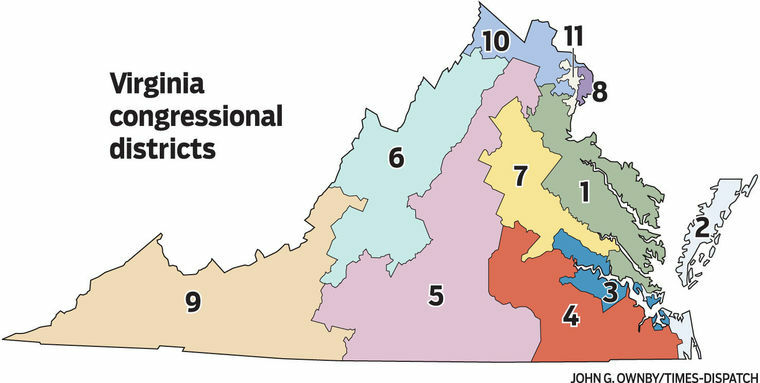 Virginia’s District 3 shows how contorted that gerrymandering has become. Florida emerged victorious in the gerrymandering debate. The GOP is not only permitted to use the existing racially-drawn map this year but also allowed to have only a slightly changed version in 2016. Earlier this year, the Supreme Court agreed to hear a case about Alabama’s gerrymandering that may have raised the number of blacks in one district to over 70 percent. The Supreme Court is also considering a challenge by Arizona Republicans to the state’s district map after an independent redistricting commission was mandated in 2000 to take politics out of the process. The GOP wants to draw lines for noncompetitive Republican districts. After the upcoming election, gerrymandering may become the next hot-button political topic. Another racial voting issue concerns American Indians. They’ve been able to vote for only 90 years, even a shorter time in states such as Montana that forbid those on reservations from voting because the state didn’t consider them taxpaying citizens. Other states such as Wyoming and Arizona used literacy tests to stop American Indian suffrage. South Dakota directly stopped all American Indians from voting until the 1940s, and Utah Supreme Court ruled in 1956 that Indians could be kept from voting because they were “neither acquainted with the processes of government, nor conversant with activities of the outside world generally.” Even the 1965 Voting Act required an extension ten years later specifying coverage for “language minorities” like American Indians. Currently, South Dakota suppresses the American Indian vote by failing to put a pre-election satellite voting and registration site in an isolated part of Pine Ridge Reservation despite receiving funding for the facility. Voters have to travel 54 miles roundtrip on poorly-maintained dirt roads in the snow to register and cast ballots. Over half the contributions for general election advertising comes from undisclosed sources that overwhelmingly benefits GOP candidates. Almost 80 percent of this money comes from secret money donated to the conservative U.S. Chamber of Commerce, the Koch brothers Freedom Partners, and Karl Rove’s Crossroads GPS. Restrictive voter laws will disenfranchise about 5 million low-income and minorities voters. Facing these odds, progressives will be lucky to get any representation in state and federal legislative chambers. This is an excellent commentary on the increasing denial of voter access and voter suppression around the United States. Nel has done a good job of summarizing the methods designed to reduce voter turnout, including gerrymandering, mandatory photo ids, reduced early voting, and elimination of same-day voter registration in states that had previously allowed this. Another source for this information is The Brennan Center for Justice. It also has an excellent report on the current status of voting and elections in the US. It report is titled “The State of Voting in 2014.” It covers both the voter suppression issue as well as an increased access to the ballot in some states. Sixteen states have passed laws increasing access to the ballot since 2012; eleven of these states’ new laws will be in effect on November 4. These forms of increased access include online voter registration and other methods to modernize voter registration (like being able to have your voter registration move with you) and increased access to early voting, You can check out this report on both voter suppression and voter access at http://www.brennancenter.org/analysis/state-voting-2014.